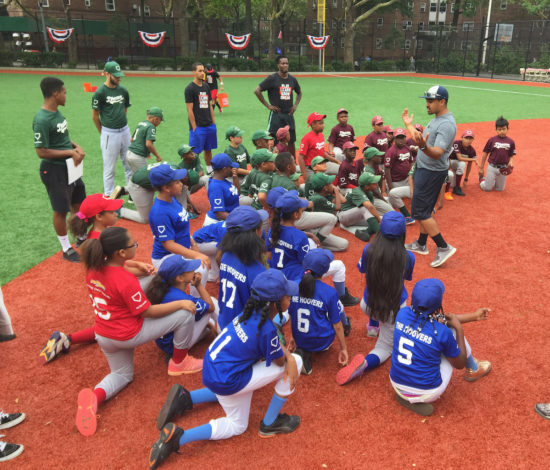 Tucked away in a corner of Mott Haven, just outside the grounds of one of the city’s largest public housing complexes, a new baseball field is providing local young people a place to play and lots of instruction to step up their game. On July 27, residents came for a ceremonial ribbon-cutting at the new field on Patterson Playground on College Avenue, and were treated to a short baseball clinic for the kids. The new field is the product of the NYC Parks Department’s Adopt-a-Park program, and the nonprofit group DREAM, which raised $1.5 million to transform an empty concrete lot on the playground into a synthetic turf baseball diamond, complete with dugouts and an outfield fence. Clarisa Alayeto, family and community engagement coordinator for DREAM, said that the park is more than just a place for kids to play. Alayeto grew up in Patterson Houses and attended PS 18, right next to the new field. “It will surround our youth with loving adults and a larger programming that will push them to learn, to grow, to go to college, and to come back and lead this community,” said Alayeto. DREAM, formerly known as Harlem RBI, will host after-school and summer programs at the new field, to provide kids with opportunities to recognize their potential on the diamond and in the classroom. Young people fielded grounders and pop flies, and dove and slid fearlessly on the soft turf during the half-hour clinic that kicked off the event. 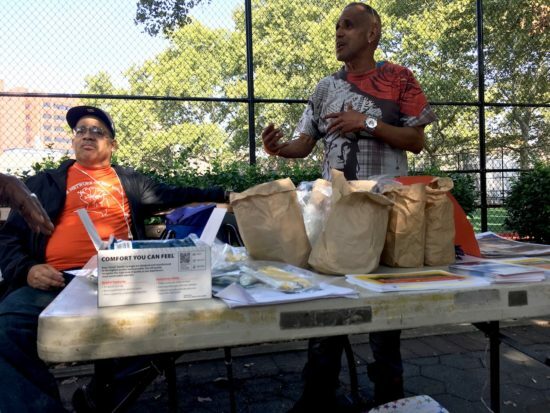 Bronx native Justin Perez, 21, was one of the volunteer coaches who led the clinic. Perez remembers what having a dedicated baseball coach meant to him growing up. “Just seeing how many sacrifices he made for us, and how much it actually paid off, it just shows that I want to do the same thing,” he said. Parks Commissioner Mitchell J. Silver, City Council Speaker Melissa Mark-Viverito, Bronx Borough President Ruben Diaz Jr., and former New York Yankee Mark Teixeira, who serves on DREAM’s board of directors, were among those who came to christen the new field. 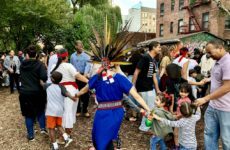 So far, funding pledges for the next phase of the renovation include $2.2 million from Mark-Viverito’s office and $300,000 from the mayor’s office, to build new basketball and handball courts, and to add new play equipment, swing sets, and a community garden. Construction is set to begin in the fall of 2018. Gloria Anderson, who lives in the Patterson Houses, came out to see her great grandson play during the clinic. Anderson, 61, said that the new field and upcoming renovations to the park are long overdue. Another resident, Carmelo Paduani, said that transforming the old concrete slab into a space for athletics is good for the whole neighborhood. Paduani, 34, said his nephew, who attends PS 18, is eager to take part in the activities that will be programmed on the field. 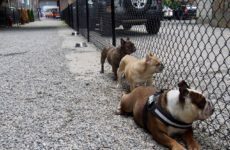 “It’s more protected for the kids to do something, especially for the summer time, and get them out of trouble,” said Paduani.